Take Current Affairs quiz February 11, 2019 to enhance your General Awareness. Practice with our esteemed Current Affairs quiz February 11, 2019 questions which covers all important events across India as well as World. Make use of all important Current Affairs quiz February 11, 2019 questions with answers updated here, at free of cost to succeed in all competitive Exams and Interviews. With which Country did India sign a letter of intent for Marine Pollution Initiative recently? Voltas Limited has announced to set up its new plant in _________. Voltas Limited, a market leader in residential air-conditioners in India, plans to set up a new manufacturing facility at Tirupati in Andhra Pradesh. The cost of the facility is Rs.500 crore. Where was the multinational maritime exercise AMAN-19 held? The 5-day multinational maritime exercise ‘AMAN-19’ was formally commenced at Pakistan Navy Dockyard, Karachi. The parasitic intestinal worms in India, also known as ________. The parasitic intestinal worms in India, also known as Soil-Transmitted Helminths (STH). When is the National Deworming day celebrated? India celebrates the National Deworming day on 10th February. The National Deworming Day is an initiative of the Ministry of Health and Family Welfare, Government of India. Which of the following has made Hindi as third language in courts? The Abu Dhabi Judicial Department has added Hindi as the third official language of the city’s courts. World Pulses Day is celebrated on ________. World Pulses Day is celebrated on 10th February 2019.
Who launched Law, Justice and Judicial Power Justice book ? P N Bhagwatis launched Law, Justice and Judicial Power Justice book. Which region has been declared as Jammu & Kashmir’s third administrative division? Ladakh declared as Jammu & Kashmir’s third administrative division. Who is appointed as Ambassador of India to the Republic of Marshall Islands? Sanjay Kumar Verma is appointed as Ambassador of India to the Republic of Marshall Islands. 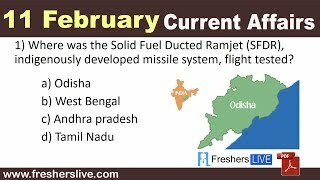 Solid Fuel Ducted Ramjet (SFDR),indigenously developed missile system successfully flight tested in Odisha. Which social network acquires GrokStyle virtual search start-up to boost AI capabilities? Facebook acquires GrokStyle virtual search start-up to boost AI capabilities. Are you looking for right place to enhance your Knowledge on Current Affairs of 11th February 2019 through effective Quiz section? FreshersLive grants you the advantageous Current Affairs Quiz questions with accurate answers for 11th February 2019 which covers all the important events, supreme Awards, major occurrences in the National as well as World level. All important Current Affairs Quiz questions of 11th February 2019 are updated instantly in this page. Everyday at least 25+ Current Affairs Quiz Questions are displayed in this FreshersLive page. Correct Answer for each quiz question is given at the end of the entire 11th February 2019 Current Affairs Quiz questions section. You can estimate and upgrade your GK by attending these useful quiz questions. Entire quiz questions of 11th February 2019 Current Affairs covers Competitive Exam as well as Interview point of essentially important topics like International News, National News (ie. Indian Affairs), Science & Technology News, Environmental News, Bills & Acts Passed by Government, Defence News, About important Persons, Places, Banking & Economical News, Awards & Honours, Sports News, Revolutionary Updates on Arts & Culture, Obituary, Summits & Conference, Important Committee, Schemes, Appointments, Important Days & its Theme for Current as well as upcoming Year, Books & Its Authors, Agreements & MoUs, Budget, Taxes, Various Important Lists & Indexes, Visits by World Presidents, Prime Ministers, Political affairs and all Current Events. 11th February 2019 Current Affairs Quiz Questions updated in this page are prepared in the sense to help all aspirants to succeed in various Competitive Exams like UPSC IAS and other Civil Services Examination, Various Bank exams like IBPS PO, IBPS Clerk, SBI PO, SBI Clerk, RRB PO, RRB Assistant, Insurance exams like LIC AAO, UIIC Assistant, Railway Exams, Various Central Government Exams like SSC CGL, SSC CHSL, and more. Attempt all the Current Affairs Quiz Questions of 11th February 2019 and evaluate your score by matching your response with the correct answers mentioned at the end of this quiz questions section. By practising the FreshersLive Current Affairs Quiz Questions on a daily basis, you can surely succeed in the competitive exams as well as the interviews easily. Make use of this ultimate resource to the fullest and quickly achieve your goal!